In the world of technology and phone apps, LiftMaster garage door openers are keeping up with the current times. Being a preferred garage door dealer for LiftMaster openers, I do admit that when all the internet tech savvy apps started being applied to garage door openers my first response was to say ” Why?” However, as many things go – One day when my husband and I returned home from a weekend trip up north he asked, “I wonder if we closed the garage door before we left the cabin?” (With the cabin 2 hours away, this was not the time to have this thought.) Then I remembered all I needed was my smart phone and my MYq app. It would take just a second to answer this question. Thank You LiftMaster – MYq technology gave my husband and I piece of mind that indeed we did close the garage door! It brought me back to another time when I thought why I would ever use Siri on my Iphone. I smiled and laughed. THE NEW COLORS HAVE ARRIVED! North Central now offers Oak and Cherry steel in Models: TR138/AR138 & TRII/ARII. We are always very excited to offer more options to our customers. These doors can be the perfect compliment to your outdoor curb appeal. March is a very busy month – St. Patricks Day, Easter, the arrival of Spring, hocky and basketball tournements. March is also a great month for garage clean up and organization. Here are 3 ideas found in Better Homes and Garden we thought you may enjoy. 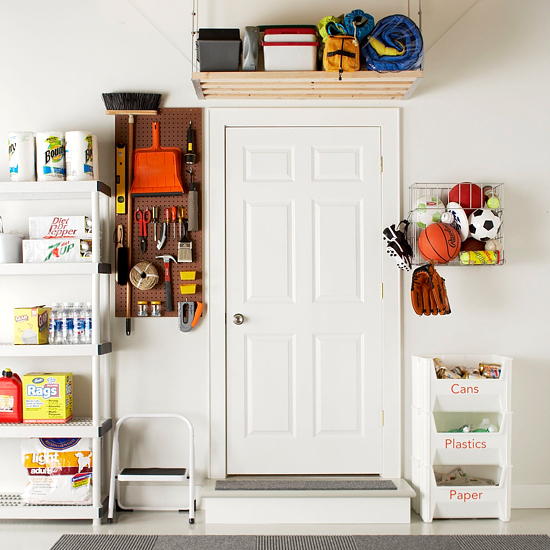 A garage is on optimal place to organize and store not only garage gear but also off-season belongings. 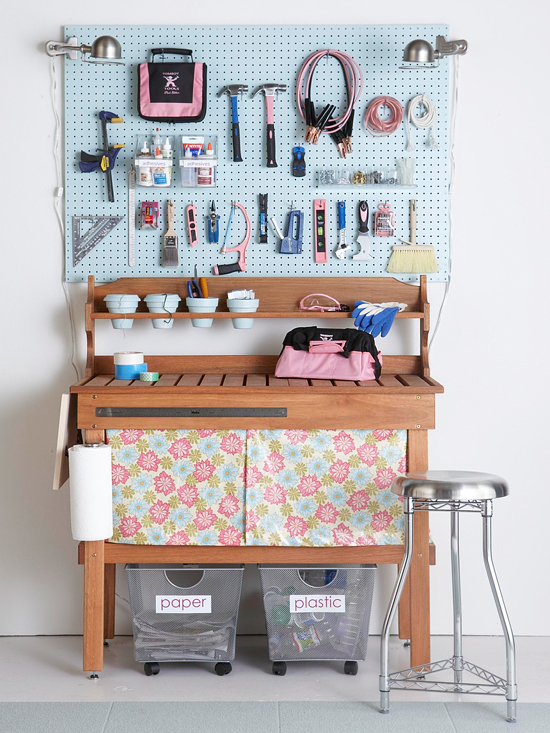 Combine different storage solutions to make a complete workstation. 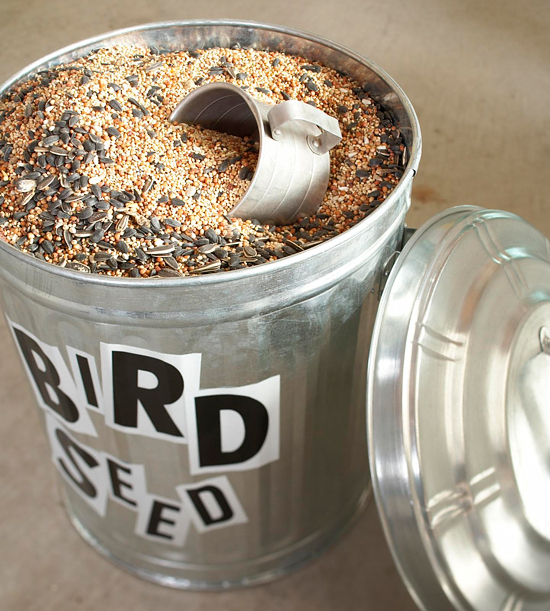 Store such things as birdseed, sand or salt. Make sure to place a cup inside for easy measuring! We know cleaning the garage after a snowy and cold winter can be a daunting task. Good Luck to you all!! My favorite overhead door for many years has been North Central Door Company’s Model TR-138 and TR-II. North Central is a smaller manufacturer who packs a lot of quality into their thermal line of garage doors. I recently received a phone call from a customer that said they loved there TR-138 door as much today as when we installed it 10 years ago! What an endorsement! The TR-138 (1 3/8”) and TR-2000 (2” think) comes in a variety of styles. The Classic Raised Panel, Long Panel Ranch and a Carriage Stamp. All doors offer 26 gauge front and back steel, with a bonded polystyrene insulation. If, your feel you need even more pizzazz, add windows and outside hardware. Year after year North Central gets voted our favorite polystyrene insulated garage door – cost, quality, and good looks make this door #1! The National Safety Council www.nsc.org has named June National Safety month for your home. I thought this would be a good time to remind us of the safety needed for and around your garage door. 1. Make sure the garage door opener control button (wall button) and outside keypad is out of reach of small children. 2. Do not let children play with garage door remote controls. 3. Know how to disconnect the opener from the garage door. 4. Visually look at cables for signs of fraying and weakness. 5. Test the garage door opener’s reversing system. 7. If the garage door will not open or seems sluggish, check above your door for a broken spring. A broken torsion spring will have a separation between the coils. Using your garage door with a broken spring will wear out the gears in the garage door opener unit. Springs are very dangerous and should be replaced by a professional. 8. If you are using your garage door manually (without a power opener) always use a lift handle. This will avoid pinching your fingers between the sections. A drafty, un-insulated garage door may not be an obvious culprit in rising monthly utility bills, but it’s worth giving it a second look if you have an attached garage. Garages are more susceptible to temperature fluctuations given how often the garage door is opened and closed every day. Since attached garages typically share one or two common walls with the house, any hot or cold that travels through the door will ultimately affect the adjacent living areas. 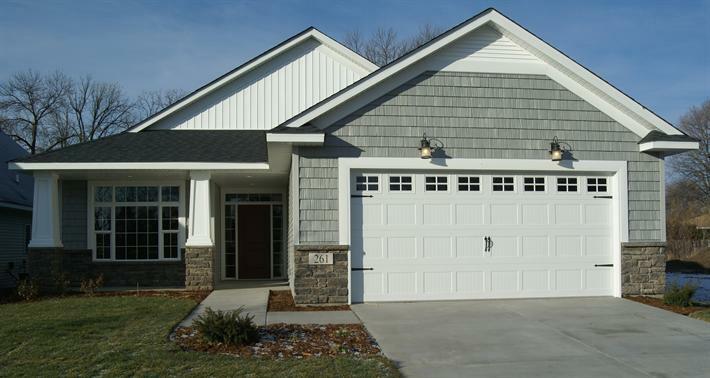 An insulated garage door can help stabilize temperatures in the garage to reduce heat loss or gain. The same principle applies to your front door. If you’re thinking about upgrading to a more energy efficient model, stop making excuses. Myth: Upgrading my garage door or entry door won’t save that much energy. 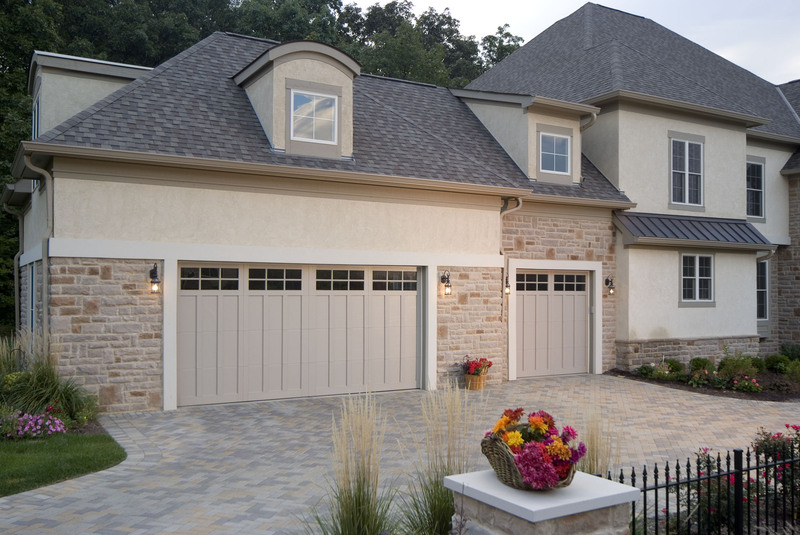 Reality: A new, energy efficient garage door can reduce energy loss through the garage by up to 71%. Depending on the specifics of the home, a well insulated door can keep an unheated garage 10 to 20 degrees warmer on a cold winter day. That can have a significant impact on the comfort of family rooms or bedrooms located above or next to the garage. It’s also important if items like refrigerators, washers and dryers or water heaters are located in the garage. There are two different types of insulation used in garage doors: expanded polystyrene and polyurethane. The higher the R-value, or the lower the U-factor, the more energy efficient the insulation is. Doors constructed from both kinds are strong and durable. The video below is a perfect “How To” video on painting your garage door. Watch how the hosts of “Around The House” paint this HAAS Thermal garage door.